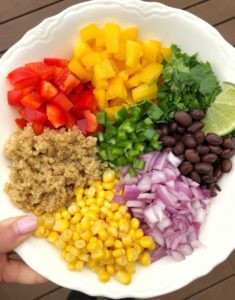 This Mexican Quinoa Salad with Cilantro Lime Dressing is the perfect side dish to any meal! With Cinco de Mayo being yesterday, I shared on my Instagram I wanted to create a recipe that was Mexican inspired that wasn’t tacos. Although nothing wrong with tacos because who doesn’t love them?! My friend Katie was telling me about a quinoa salad she made that her mom sent her the recipe for and I had been wanting to recreate something similar. With the holiday coming up, I figured it was the perfect time to whip together something like this so I got to work! The flavors of the fresh cilantro, all of the fresh onions and veggies, the lime – they just WORK! Mexican food is better when its fresh and flavorful and that is exactly what this salad is. We added shrimp to it after the picture and served it along side some chips and guacamole because we needed to celebrate accordingly. One of the best parts about this salad is that it makes a ton, so if there are leftovers that’s OKAY because they get even more flavorful as they sit. Which also means that you could make this the day before and it would just be all the more flavorful. You’ve got to make this salad! Everyone will love it. 1/3 packed cup cilantro, chopped. In a pot, add quinoa and veggie broth. Bring to a boil. Once at a boil, cook for ~15 minutes or until all liquid is absorbed and quinoa is fluffy. Use a fork to fluff. Prepare all vegetables and cilantro and combine in a large mixing bowl. Add in quinoa and stir to combine. For the dressing, mix all ingredients together in a small mixing bowl. Pour overtop of the quinoa mixture. Stir to combine. Previous Post: « I Quit My Job.